Languages and translations for core PrestaShop e-commerce, modules and commercional themes. Slovak language pack for PrestaShop 1.6.1.21 (final - 10/03/2018). Package contains the translation of Front and Back office, e-mail templates, setup wizard, MySQL database data, graphics and accessories (image manager), demonstration data as well as 20 other modules that are not included in the PrestaShop basic installation. Czech language pack for PrestaShop 1.6.1.21 (final - 10/03/2018). Package contains the translation of Front and Back office, e-mail templates, setup wizard, MySQL database data, graphics and accessories (image manager), demonstration data as well as 20 other modules that are not included in the PrestaShop basic installation. The complete Slovak language pack for the latest PrestaShop 1.5.6.2. Includes translation of front office, whole back office, MySQL database, graphics parts and accessories (TinyMCE and AJAX manager). Complete Czech language pack for the latest PrestaShop 1.5.6.1. Includes translation of front office, whole back office, MySQL database, graphics parts and accessories (TinyMCE and AJAX manager). Slovak language pack for responsive PrestaShop commercial theme Boutiques. Including translation of shop front office, additional theme modules and their back offices. Slovak language pack for responsive PrestaShop commercial theme Sellya. Including translation of shop front office, additional theme modules and their back offices. Slovak language pack for responsive PrestaShop commercial theme Leo Flowers. Including translation of shop front office, additional theme modules and their back offices. Slovak language pack for responsive PrestaShop commercial theme Transformer (PrestaShop 1.5.x a 1.6.x). Including translation of shop front office, additional theme modules and their back offiece. Slovak language pack for responsive PrestaShop commercial theme Autumn. Including translation of shop front office, additional theme modules and their back offices. Slovak language pack for responsive PrestaShop commercial theme Alysum. Including translation of shop front office, additional theme modules and their back offices. Slovak language pack for responsive PrestaShop Wine Shop commercial theme. Including translation of shop front office, additional theme modules and their back offices. Slovak language pack for responsive PrestaShop Leo Tea commercial theme. Including translation of shop front office, additional theme modules and their back offices. Slovak language pack for responsive PrestaShop Leo Drinks commercial theme. Including translation of shop front office, additional theme modules and their back offices. 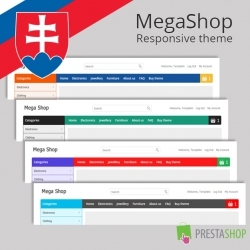 Slovak language pack for responsive PrestaShop MegaShop commercial theme. Including translation of shop front office, additional theme modules and their back offices. Slovak language pack for responsive PrestaShop RainDrop commercial theme. Including translation of shop front office, additional theme modules and their back offices. The Slovak language pack for responsive PrestaShop Cherry Shop commercial theme. Including translation of shop front office, additional theme modules and their back offices. Slovak language pack for responsive Lilama Mega Shop PrestaShop commercial theme. Including translation of shop front office, additional theme modules and their back offices. Slovak language pack for responsive PrestaShop commercial theme Accessories. Including translation of shop front office, additional theme modules and their back offices. 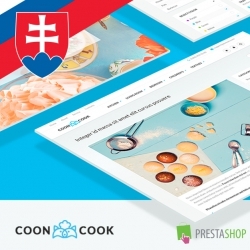 Slovak language pack for responsive PrestaShop commercial theme CoonCook. Including translation of shop front office, additional theme modules and their back offices. Slovak language pack for responsive PrestaShop commercial theme TemplateMela Tools. Including translation of shop front office, additional theme modules and their back offices. Slovak language pack for responsive Leo Gift Shop PrestaShop commercial theme. Including translation of shop front office, additional theme modules and their back offices. Slovak language pack for responsive Warehouse PrestaShop commercial theme. Including translation of shop front office, additional theme modules and their back offices. Slovak language pack for responsive SNS Nova PrestaShop commercial theme. Including translation of shop front office, additional theme modules and their back offices. Slovak language pack for responsive PrestaShop commercial theme Panda. Including translation of shop front office, additional theme modules and their back offices.